The UK has the most centralised system of government amongst major economies. This results in poorer services, lower economic growth and higher taxes. We have also developed an approach to devolution that is incoherent and unstable. This short book proposes an entirely new set of constitutional arrangements. It proposes that the UK should develop a federal structure of government with only a small number of functions such as defence and border control being determined at the UK level. All other functions would be the ultimate responsibility of individual nations within the UK, though Wales, Northern Ireland and England could combine together if they wished. 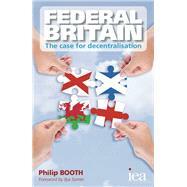 The author also proposes further radical decentralisation of government. Local government should become responsible for a much wider range of functions and raise the revenue to finance them. In areas such as health and education, the government role would be diminished further as parents, families and civil society institutions are provided with finance to directly procure their own services. Overall, this is a radical plan to completely change the nature of government in the UK.It would return power to the people and reverse the long trend of centralisation that has happened since World War I.